Peoria We are coming for you! Even if you’ve been talking for years, chances are you could use a little help in the public speaking department. Unless you’re Tony Robbins. If you are Tony Robbins, hi! Thanks for stopping by. If you’re not Tony Robbins, which odds are good that you’re not, we’re here to help you. Joke Deli helps you find your strengths so you can bring your own style and voice into your everyday work experience. Your presentations will be fresher and uniquely you. Cookie cutter presentations get the job done, but they don’t stand out. Making yourself memorable, using your own strengths, and building relationships based on who you are will help set you apart and keep clients coming back. 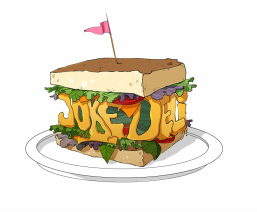 Joke Deli is going to help you easily bring yourself to the table. Joke Deli is an all-ages establishment. Not only do we cater to experienced professionals, we also offer workshops for college students and young professionals getting started in their careers. Landing a job is more than just presenting your resume and wearing a nice suit. Employers want to hire YOU, not a piece of paper. Nail your interviews by showing your confidence, assertiveness, and complete comfort in your own personal speaking style. Honesty is refreshing in interviews, and will help you find a job you actually want. Joke Deli was created by experienced performers and marketing professionals Kristin Clifford and Kelsie Huff. Kristin and Kelsie are available for performances and workshops.